Blizzard is also testing a feature that will allow players to purchase additional level 90 character upgrades. When Warlords of Draenor, the latest expansion pack for World of Warcraft was announced, one of its major selling points was the one-time ability to instantly level any character to level 90. Well, I've got some good news and some bad news. The good news is that you'll be able to use the level 90 upgrade as soon as you pre-purchase the game, which should give you plenty of time to be acquainted with the class. The bad news is that it looks like the level 90 upgrade will be a pre-purchase bonus exclusive. 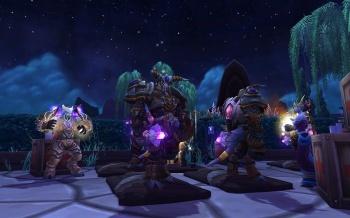 If you do miss out on pre-purchasing the game, or you wish to use the instant level 90 upgrade on multiple characters, Blizzard said that it is testing a feature that will allow players to purchase additional upgrades for a fee, similar to how a paid race or faction transfer currently works. It should be ready by the time the expansion comes out. "We'll have more information to share later-including details on our character-upgrade plans for Asian regions where players don't buy expansion boxes-but you'll start seeing pieces of the process soon on the PTR, so keep an eye out," said Blizzard. Additionally, if you pre-purchase the digital deluxe version of the game, you'll get your exclusive pet and mount as soon as you payment is processed. Blizzard said that the Warlords of Draenor closed beta test will start Soon, although an official release date for the expansion has yet to be announced. I should note that it may have just been an awkwardly-worded blog post, and we have reached out to Blizzard to confirm whether or not the level 90 bonus will be exclusive to pre-orders. Update: Good news everyone! Blizzard has confirmed to us via e-mail that the level 90 boost will be available to everyone who purchases the expansion at any time before or after its release, not just those who pre-purchase.